Graphs at a glance: mortality rises by 19% in England's winter. One in five of these excess deaths are caused by cold homes. UPDATE NOV 2016: In 2012 so-called “avoidable” winter deaths were at 24,000. Since then the death rate has almost doubled. According to the latest ONS figures, almost 44,000 “excess” deaths were recorded for the winter of 2014/15. This was the highest number recorded since 1999, with 27% more people dying in the winter months compared with the non-winter months. The majority of deaths (36,300) occurred among people aged 75 and over, with cold weather and underlying health conditions cited as key causes. Virulent strains of winter flu, along with housing conditions and energy bills, are also thought to be contributing factors. "Every year, mortality rises by 19% in the winter months in England. This amounts to an average of 27,000 “excess” winter deaths (EWDs); 90.8% of which last year were in the over 65 age group. The majority of these deaths occur among older people, especially women, and those with underlying health problems. However, they are not people who would have otherwise died at that time. Most deaths are due to cardiac disease, strokes and respiratory problems, not hypothermia. The Marmot Review Team also found there was a greater risk of death in colder housing than in the warmest housing, estimating that 21.5% of all excess winter deaths could be attributed to cold homes. They also claimed that each centigrade degree reduction below 18°C in temperature in the UK corresponded with an extra 3,500 deaths. 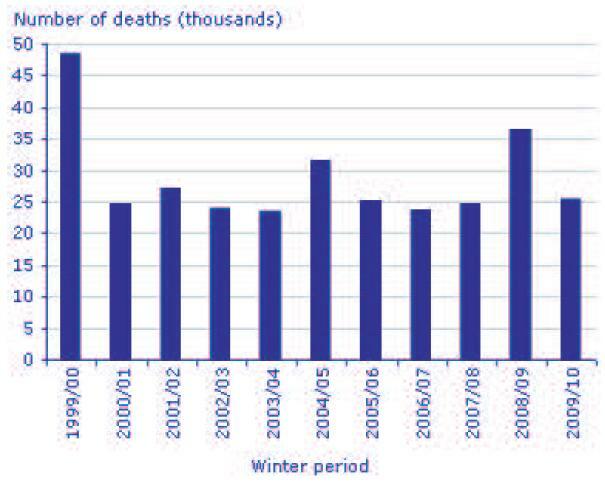 In the winter period (December to March) of 2011–12 there were an estimated 24,000 more deaths in England and Wales, compared with the average for the non-winter period. The overall figure represents a death rate of around eight pensioners an hour during the four month period in question." "There are specific reasons why older people are more susceptible to cold weather. Most EWDs (40%) are due to strokes and heart attacks because the blood becomes more liable to clot in people exposed to the cold. Older people are more susceptible to clotting because their blood vessels tend to have rougher linings than those of younger people. As a result, a 1oC lowering of temperature in the living area of an older person is associated with a rise of 1.3mmHg in their blood pressure, due to cold extremities and lowered core body temperature." "An added complication for older people is that they have reduced skin sensitivity to cold and a reduced perception of how cold it is, thereby making them slower to react to protect themselves. 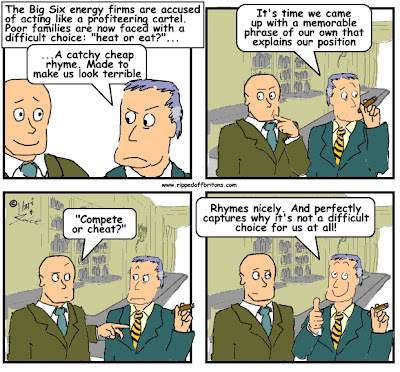 They are also more likely to be suffering from chronic conditions which may also lower body metabolism which means the body generates less heat, while stroke, Parkinson’s disease and dementia restrict activity, slowing body heat generation and conservation"
We still think you're off the mark with this - Bill are too high, yet energy in the UK is actually fairly cheap in comparison to the rest of Europe. So what's going on? It's sometimes over looked that we have an leaky Victorian housing stock with poor energy efficiency. 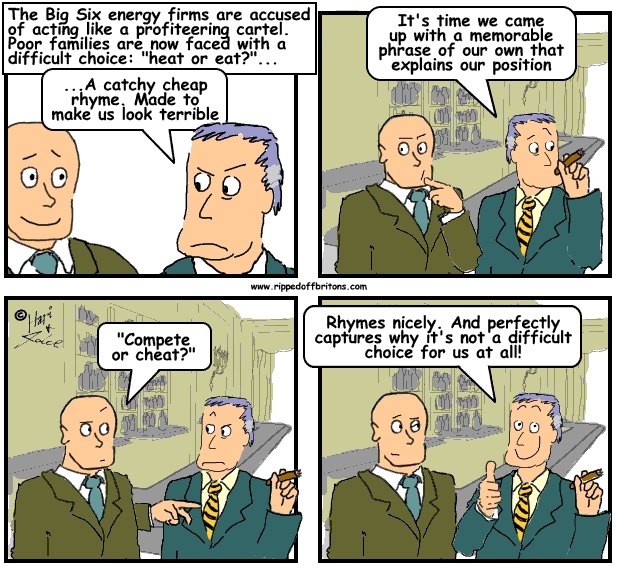 A cheaper energy source doesn't matter so much if it's all going out through poorly insulated walls, windows and doors.